The fishery and semi-culture of eastern oyster Crassostrea virginica in the Gulf of Mexico reach about 45 000 tons per year. In the Pacific Northwest region of the country, the production focuses on two main species: pleasure oyster Crassostrea corteziensis (via fishery and aquaculture), and Japanese oyster, Crassostrea gigas (exclusively via aquaculture). The production is about 5 000 tons per year. Even though the protozoan parasite Perkinsus marinus, the etiological agent of “dermo disease”, was observed by first time in 1950 in oysters from Tampico, Tamaulipas (North east Gulf of México), and is present today in all coastal Mexican lagoons of the Gulf of Mexico, it has not necessarily been related with recent massive mortality episodes. On the other hand, P. marinus was discovered in the pleasure oyster from the Pacific coast of Mexico in 2006. So far, it has been detected in several species of bivalve molluscs from the region. The negative impact of the parasite on native oysters such as C. corteziensis and mangrove oyster Saccostrea palmula is limited and has not been related with massive mortality episodes, even less in C. gigas which is known to be more resistant to develop dermo disease. However, surveillance is necessary in a scenario of climate change that may affect the host-parasite interaction. Genetic data and historic translocations of eastern oyster from the west coast of US and Gulf of Mexico to coastal lagoons of the Mexican Pacific, with commercial purpose, have been related with the introduction of the parasite. Also, an important issue for the production of Japanese oyster is the presence of at least 5 genotypes of oyster herpesvirus OsHV-1, which induce mortality episodes in larvae and juvenile oysters, reaching from 30% to 90% mortalities. The differential virulence of the virus remains unknown. These viral genotypes cause important losses for producers in the early steps of culture. Therefore, an improved control is needed. Different environmental conditions prevalent in the 3 states where C. gigas is farmed seem to be a key factor for host-pathogen interactions, in relation with massive mortality episodes or low productivity. 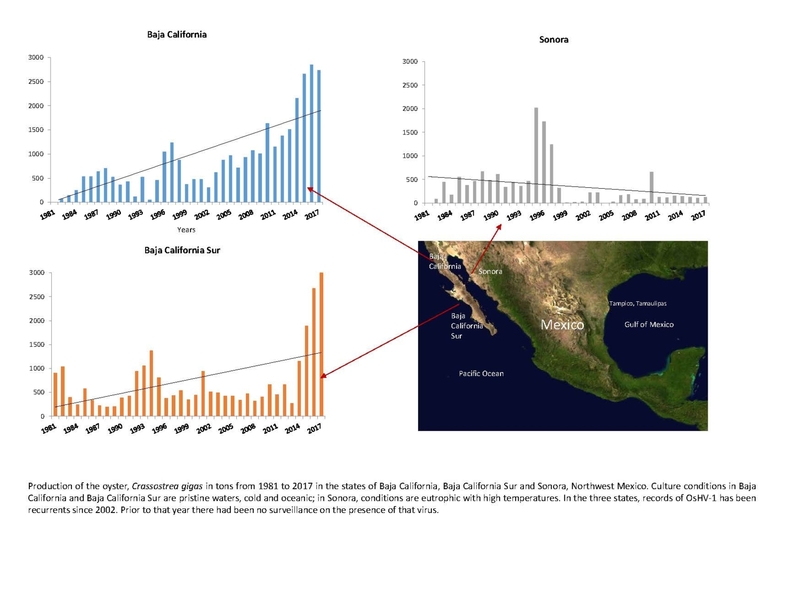 Trends of production in Baja California, with cold and pristine oceanic waters continue to increase, while in Baja California Sur, an increase was noted lately. However, this area is regularly affected with thermic anomalies and El Niño conditions (summer mortality conditions). Finally, in Sonora, where the culture is carried out in eutrophic coastal lagoons and high temperatures, the production continues to decrease (see figure). In the 3 states, there have been records of OsHV-1 infection. Our research efforts are focused on (1) determining a differential susceptibility of bivalve mollusks to P. marinus in the region; (2) characterising and determining differential virulence of OsHV-1 genotypes and developing practices for its control; (3) determining the environmental influence in mortality events.